Let's say you have no money. What would you do? Get a job maybe, right? One individual in Tochigi Prefecture, Japan hatched a different plan. A 33-year-old employed man apparently offered retro games like Mike Tyson's Punch-Out!! on online auction sites. But one winning bidder claims that instead of the actual retro game cartridge, pirated copies of the game were sent on CD-R2 discs. "Despite winning the auction for a Famicon cassette," claims one individual, "I was sent a CD." 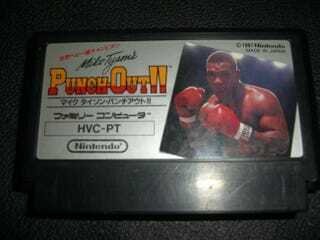 In 1987, Mike Tyson's Punch-Out!! was released on Nintendo's Family Computer (aka "Famicom") game system. The 33-year-old was arrested, accused of violating Japanese copyright law. He's also accused of doing things like selling 1,135 Famicom games burned into CD-R discs for anywhere between ¥60,000 to ¥74,800 (US$726 to $906). "I sold them, because I don't have any money," the suspect told police. Japanese authorities continue their crackdown on individuals who violate copyright law by either selling pirated games or even renting retail copies.